Nier Automata is still my personal game of the year, and while there still are some great looking games on the horizon, it's going to be extremely difficult for any of them to knock it off my top stop. With fantastic game, an amazing soundtrack and an incredible, thought provoking story, Nier: Automata is a game I won't be forgetting anytime soon. However, without giving anything away, it's also one of those games where you get what I like to call "the great depression" after finishing it, because it's hard to say goodbye to the characters and the world that you fell in love with. Thankfully some DLC has been released for Nier: Automata, ridiculously titled "3C3C1D119440927", this DLC was able to somewhat fill the hole in my heart that can only be filled with more Nier. The first thing of note about the DLC is that getting to play it can be a little frustrating. Those who have finished the game and gotten Ending E will know exactly what I'm about to talk about. You better hope you didn't erase your save file, because if you did, you will need to play through the game again as the DLC can only be played if you have gotten at least Ending D. Although, that really isn't that bad because this game is fantastic and it would give you a great excuse to play through it again. From there you can select a chapter to load. I can't say exactly which chapter but those who have completed the game should know a good place to load up the game. After walking around for a bit, you will get a message at your terminal and three new locations will be marked on the map. One in the forest, one in the desert and one in the flooded city. All three of these locations offer arena challenge missions, each with their own special twist to them. In all of the fights however, your items are completely restricted, so if you think you are going to be able to spam healing items like in the normal game, you are out of luck here. Boy, did I not realize how much I relied on those items in the main game until I tried these challenges. I kept pressing down on the d-pad over and over again to use healing items only to not have them be locked out and I would die constantly. Anyways, the first arena in the desert has you complete five separate challenges of increasing difficulty and with a twist added to each fight. You may have to fight in the dark, or fight without dodging, and to complete each challenge, you will need to survive and defeat waves of enemies that all increase in difficulty. The second arena is in the flooded city. Once again, your items are all restricted but this one is just plain wave based fighting. The final one in the forest is probably my least favorite because it requires 9S. Now, there is nothing wrong with 9S as a character, he is fantastic and I love his hacking ability, but unfortunately the hacking ability isn't much fun in an arena setting. In this arena you can only fight by controlling other robots. Which robot you choose to control will usually depend on your play style as there are ones that can use guns and bigger ones that can only use their hands. In my opinion, fighting as the robots isn't as much fun as playing as the normal characters and the robots are annoying to control. The other thing that should be noted about the DLC is that even if you didn't erase your save file, you better be sure that you have a high level. There are five levels to each of the arenas and most of them go from a recommended level of 25-30 at level 1, all the way to level 90 at level 5. Unfortunately, my current save file is only up to level 60 and grinding all the way to level 90 would take forever, no I never got to finish all of the arenas. I would give myself and A for effort however as I bravely went into battle with my level 60 file..... and got decimated immediately. Of course there is also one other challenge in the DLC and that is the ability to fight both the CEO's of Square Enix and Platinum Games. 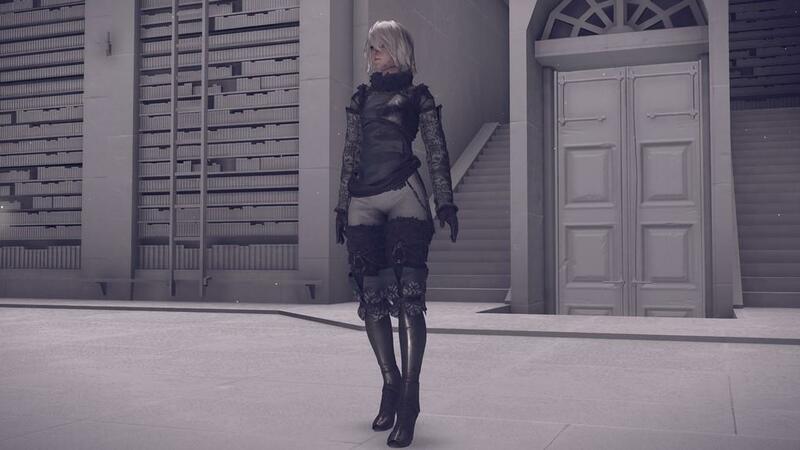 Various prizes are given out for completing certain levels in the arenas, including new music for the jukebox, new clothing accessories for 2B, 9S and A2, the ability to dye the hair of the character of choice, and of course three new costumes for each of the three protagonists based off of characters from the previous Nier game. Obtaining all of the costumes will require that you finish all of the challenge arenas. One final thing of note that I should mention is that even though the DLC is mostly challenge arenas, they still found a way to tug at your heat strings by adding a bit of story into the DLC as well. When you head to these arenas, you will notice things like robots begging for their lives or some robots asking "will you use my body? ", of course all for the sake of entertainment. You will have crowds of androids and robots alike in these arenas watching from the stands and cheering you on while the slaughter commences. 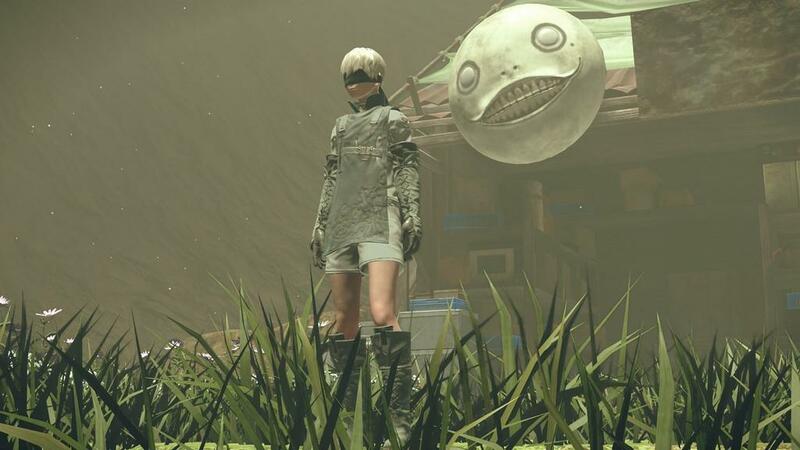 While not as thought provoking as the main story, I do appreciate them trying to slip in some story that fits right in within the world of Nier Automata. If you looking for a reason to hop back into Nier: Automata, 3C3C1D119440927 is a great reason to do so. Even if you aren't leveled high enough to complete all of the challenges, there is nothing wrong about going around the world and grinding yourself up to finish them.